TwoNav is a dual navigation software (on-road / off-road) for all your outdoor activities (hiking, biking, skiing, geoacaching, ...). TwoNav can also guide you when you drive. It is a solution for all your orientation needs. Load maps, tracks, routes and waypoints on your GPS device and there you go! - Save the driven route as a track and select from more than 60 options the information to be displayed on the screen. Roadbooks, Alarms, Virtual Coach, Man Overboard ..., no matter what activity you do, TwoNav is always the right companion for you! On this website is useful for the user compiled. The websites have nothing in common with the company CompeGPS. However, CompeGPS has approved the release for publishing* and my website or brochures. Here you will find help on the areas of "The new Aventura", "FAQ Dictionary", "News & Tips" and also "Maps for Users". The page FAQ Dictionary contains everything about the navigation software TwoNav and the corresponding program CompeGPS Land. The readings can be seen as a PDF download and as a foliage book and are currently being discussed. even the previous versions. The area The Aventura is dedicated to the new Aventura and contains all the latest news and information about it. 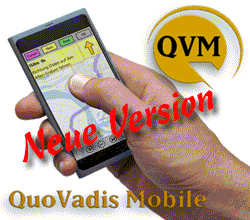 In the area Maps for Users MPVF maps can be found, which can be used with the TwoNav software and CompeGPS Land. For the most part, these have been generated from the OSM map data, or created especially for mountain bikers or hikers by TwoNav users. In News & Tipps are always news about the software TwoNav, CompeGPS country or third-party listed. Just drop in occasionally to see what's new in TwoNav. On the FAQ Dictionary page there is a List view which contains downloads from the areas TwoNav and CompeGPS Land. It can be chosen instead of the "drop-down" menu, as here are a few explanations attached. The most enjoyable thing for the end user is that I provide my two readings as "free" works here. Much of it has been taken from the Naviboard forum and collected by some little "helpers". If you have special help or support inquiries concerning the TwoNav ID, activation of the software, or especially the support, please contact the Support from CompeGPS. Now I wish "lots of fun" while browsing and reading, in the TwoNav GPS brochures. *I would also like to point out that my readings are not "official tutorials" of CompeGPS / TwoNav and in some areas (but they are specially marked) require an experienced user.